Not to confused with our own daily report here at Geegeez, The Shortlist is the latest offering from Michael Carr at Lucrative Racing. Michael has been in the game for some time now and we've reviewed plenty of his stuff in the past. Unless you've been living under a rock recently, you'll have received several emails about this new service from other affiliates promoting it, but we'd never promote a service without trialling it first, so now the initial flurry had died down, we'll review The Shortlist for you. The Shortlist is basically a horse racing tipping service, providing approximately 8-12 selections each day around 10.00am, posted to a dedicated members' area online. In the current trend of bookie restrictions etc, my interest was piqued by the fact that bets can be placed either using bookmakers, betting exchanges or at Betfair SP and it is this latter approach that appeals to me. As of yesterday (23/09/18), The Shortlist claims a record of 954 winners from 2600 selections with that 36.7% strike rate generating level stakes profits of 241.23pts at Betfair SP at an ROI of just under 9.3%. And I've been receiving the selections for the last two weeks in pre-review mode, waiting for Michael to re-open the doors to the service, in which time The Shortlist has hit 59 winners from 161 selections with a 36.6% strike rate generating level stakes profits of 39.23pts at Betfair SP at an ROI of just under 24.4%, so the strike rate is pretty consistent, but recent winners seem to have paid more! "I’d actually recommend taking a mid-morning bookmaker price seeing as it’s produced 60+ additional points profit so far. Close to post-time (9.30 - 10am) is ideal, but anytime before midday will likely still prove more profitable than BSP...."
The bets are advised to be backed as a straight win if the odds are under 4/1 or as an each-way bet at odds of 4/1 or above, so we'll be basing our results on a £10 win or £5 win/£5 place basis, advising our results at Betfair SP less an assumed 5% commission on any winners. Should the trial prove successful and it's something you fancy, membership to The Shortlist is currently priced at £39 per month, £99 per quarter or £299 for a whole year and you can get more information about membership (including a £0.99 1-week trial) right here. We'll now trial The Shortlist for an initial period of 60 betting days. Geegeez Gold has eight reports in its dropdown list, and the most easy to use - dare I say it, the closest to a pure tipping sheet - is The Shortlist. The fact that this example contains nine runners, of which six won and two more were second (one of them behind a nominated winner), is coincidental. Because yesterday I got the data back from 'Database Dave'. Before I go further, I want to divert your attention to the 'score' column away to the right. That will help to explain how horses qualify to be on The Shortlist. In order to qualify, a horse must have run at least twice under at least three of the five matching criteria of going, class, course, distance and field size. Green is for horses with a 33% or greater win record, and scores three points. Thus, a line of five greens (as in Chris Pea Green's and Abi Scarlet's cases above) is worth 15 points. Amber is for horses with between 15% and 32% win records under the relevant condition, and scores one point. The percentages for the place variant of the report are more stringent and are not within the scope of this article. To appear on The Shortlist report, a horse must score at least nine points; and it is impossible for a horse to have fourteen points. So the eligible scores are 9, 10, 11, 12, 13 and 15. So it was that I excitedly - and somewhat apprehensively - opened the spreadsheet containing the historical data, running back to the end of May 2014 (just over seven months) when we introduced the traffic light and scoring system. I had high hopes that the top rated 15 scores would be profitable, and I wasn't disappointed. In fact, remarkably, they have proved profitable at industry starting price. I write "remarkably", because many of these types take heavy support during the day as the general public cotton on to their profiles, and the early bird will have done substantially better than SP by availing of Best Odds Guaranteed prices. 'Line of green' (i.e. max score 15) horses have netted 39 wins from 135 runs (28.9% Strike Rate) for 27.61 points profit at starting price (20.5% ROI). 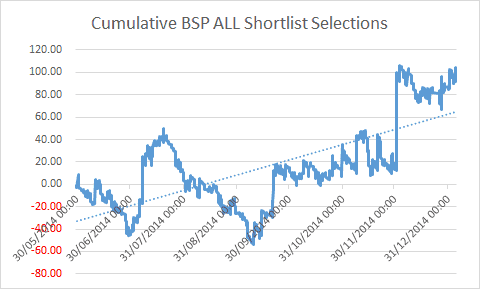 At Betfair SP, those figures rise to 47.63 units profit after commission. That's a 35% ROI. And, like I say, BOG bettors will have outperformed those profits by perhaps as much as another 10%. The downside, if there is one, is that 135 top rated picks in seven months is not a lot. Of course, allied to the excellent Stat of the Day and Double Dutch services, that's a handy little portfolio right there, and worth just over 200 points profit in 2014, all told. These aren't fancy fictional numbers. They're "pop your bets on in five minutes and get on with it" real numbers, which I - and more importantly loads of you - have been deploying daily for a good while. But I digress. Back to the sample size, which is small, granted. So what about the overall level of performance? I'll be honest here. I expected this to be a big loser overall. After all, we're talking 1617 qualifiers from 30th May to close of play Sunday (when I received the data). And lots of them with Red in their profile, implying a dislike of one or other criteria. And collectively they did lose. At SP. There was a loss of 76 points on 1617 selections at starting price, which equates to 4.7% of stakes. But, at Betfair SP (less 5% commission of course), the story was different. A good bit different. That 76 point loss becomes a 104.77 point PROFIT at Betfair SP. With all taxes paid. I have to be honest, I was pretty bloody delighted with that. I mean, don't get me wrong, I'm obviously a massive advocate of form profiling, and I knew the top rated picks were likely to be a winner. But all of them? That has been really pleasantly surprising. And here's another thing. The scoring system, whilst not quite arbitrary, was a best guess of what ought to work. And work it surely does. But let's just say 15% for the purposes of toning things down a bit. All of a sudden, that 76 point loss becomes a profit of 103 points - amazingly similar to the Betfair SP profit. Now this might take a bit of 'getting' so bear with me. Ostensibly, if 15 is the highest available score, and 13 is the next highest available, then 13 should be the second top rated score, right? Alas, no, it's not as simple as that. You see a 13 will consist of four Greens (4 x 3 = 12) and an Amber (1). My contention - and not just because the data supports it - is that four Greens (4 x 3 = 12) and a Grey (0) is preferable. But not just any grey. The most likely omission from a horse's score card is that it has never previously raced at today's course. So, and this has been the way I've looked at The Shortlist since its inception, second top rated picks for me are those that have four greens and a grey for course. Long and short, these are profitable to follow, and to a similar degree as the 'line of green' types. 'Otherwise all green but no prior course run' types won 30 of 107 (28% Strike Rate) for +32.38 (30% ROI). It's a small sample again, but extremely well aligned to the top rated. At SP, they recorded a profit of 16.82 points (15.7% ROI). And using the 15% over SP BOG extrapolation, that profit becomes 31 points. Again, spot on in line with the BSP bottom line. I've sliced and diced this dataset more than is probably healthy, and as a consequence I've found various things of interest (as well as a heap of irrelevance and happenstance). Without getting too categorical, those are quite interesting figures, to my eye at least. I don't really know why this is, but there looks to be plenty to go at for both small staking big pot hunters (14/1+), and those who like consistent winners (7/2 or less). I obviously got to thinking about this, and about whether these figures were acts of randomness, or skewed by a single fat priced winner. And, in the case of the 9's, the latter is true. On the 1st December at Kempton Park, Pretty Bubbles shocked most punters by winning at 50/1. He returned 91.65 at Betfair SP, which rounds down to 87.07 after commission. That accounts for the entire 85 point profit in one hit. The 15's did predictably well, as we've discussed; and the 11-13 range were unrewarding to blanket support. But the 10's were interesting. Really interesting. There's only one way to get a 10 score, and it's this: 3 x Green, 1 x Amber and 1 x Grey. I found this group, and their smoothest of all profit curves - almost linear, fascinating. Why was this group profitable? And why was it so consistently so? My suspicion is that the combination of the known (i.e. proven against three of today's conditions), the unknown (i.e. unproven against one of today's conditions), and the less than perfect (i.e. a middling profile against one of today's conditions) was enough to inflate the average odds on such runners without especially diluting their win chances. The table below seems to substantiate that. 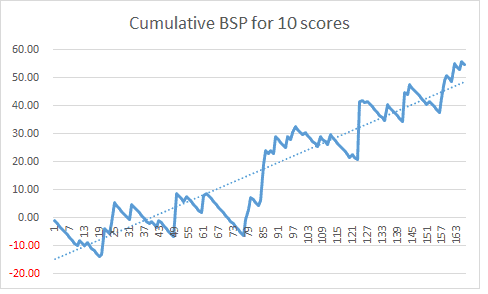 We can see that in the case of the 9's and 10's, the average win SP was around the 4/1 mark (3.97/1 and 4.16/1). That's higher than the 11's, and significantly higher than the 12's or 13's. The 15's, generally a better profile proposition, actually have a surprisingly high average win starting price of over 3/1. Although the data supports my conjecture, it would irresponsible of me to suggest that my suspicions are anything other than conjecture, and should be treated as such. The best bets remain - and I'm confident of this - the 'line of green' 15 types, and the 12's with no prior course form. Those fellows collectively accounted for 80.01 points profit over the course of just seven months. That's eight hundred quid profit for £10 stakes on a turnover of just 242 bets. Add it to Stat of the Day and Double Dutch, and you have a very nice little 'low maintenance' portfolio within your Gold subscription, regardless of how deeply you delve into the other form tools, race cards and reports. p.s. The Shortlist is geegeez.co.uk's free Feature of the Day on Tuesdays, and can be viewed here. [Note, you need to be a free registered member, and logged in, to see it. If you're not registered yet, go here to register]. Or start your Gold trial here. If you'd like to delve deeper yourself, the link below will enable you to download the dataset (as well as my various tabs of working out). Feel free to play with different scenarios, and do report back if you find anything interesting. N.B. Microsoft Excel is required to edit this file. It should open, however, in other spreadsheet applications, such as Open Office, which can be downloaded free here. Tuesday's Feature of the Day is the brilliant The Shortlist report. Responsible for both a 50/1 winning single, and a 40/1 treble in the fortnight prior to writing this explanatory post, The Shortlist is a simple traffic light profiler highlighting those horses whose historical form fits best against today's race conditions. By ignoring recent form where it's not relevant - i.e. where the conditions were materially different from today's - it shines a light on only the best of the best in the specific context of today's race. This sets it apart from almost all other form tools, and enables Gold subscribers every day - and free registered users every Tuesday - to isolate value plays away from the herds. This report is available to Gold subscribers daily, and to free registered subscribers every Tuesday. To register for a free 10 day trial of Gold, click here. Or to sign up for a free account, click here. First of all, thanks to the 150 of you who entered the World Cup 'flash' competition. I know it was a bit short notice - basically because I only thought of it yesterday morning! - but it should be a lot of fun. Those who picked Neymar will be on good terms. But remember, he'll only score ten points in the competition (his odds were 10/1 with bet365 to win top scorer, which looks big now. Best price is 7/2). Talking of competitions, did you know that you can now enter your tips into the tipping league directly from the race cards? Enter your tipping league tips right within the racecards! Just click the 'TIP' icon next to your fancy, enter your stake and check 'e/w' if you want to bet each way. Then click the big reg 'Tip On: xxxx' button. If you want to bet the horse for real, the current best odds are displayed, and clicking them will take you to the bookie with that price. Easy. Geegeez and its sponsors have already paid out over £2,000 in cash and free bet prizes, so this really is a great way to have fun and get some free bets. The tipping league is open to all registered users, both Gold and free. This month's sponsor is 888sport, and they are offfering £120 in free bets to the winner, £80 in free bets to the second placed player, and £40 in free bets to the third. Rules can be found on the rules tab here. The two main ones are 1. you must select at least 20 tips in the month, and 2. you must bet £20 with 888sport in the month. For point 2, if you don't have an account, open one here. They'll give you oodles of free bets, and have some great World Cup offers. The current monthly leader is vinceone97, and his score looks eminently catchable, especially with Royal Ascot's big-priced jamboree next week. And, with just thirteen players beating par right now, you've a fine chance of getting among the prizes. So get stuck in! Now for some more good news. The Shortlist was a popular but time-consuming daily tipping feature here on geegeez, and it came to the end of its run three weeks ago. Well, the clever techie people that help me build the geegeez cards, tools and reports have come up with a way to mechanize the process. Although it doesn't have any of the inference of a human-aggregated list, it also doesn't have any of my particular biases and foibles! It really is a very simple report, found in the reports dropdown on the racecards for Gold subscribers. Today's list is below, so you can see how it works. All columns are sortable, and the report displays those horses whose win stats get them at least two green, and three ambers. Obviously, five greens is an optimal profile, with amber being quite good, and red not good. A dash - means there is no data for that item. For instance, Just Paul has not run in today's class before, and Dubai Prince has not run at today's course before. p.s. not a Gold subscriber yet? Really?! You can take a ten day unlimited access trial here. A week or two ago, I invited subscribers to write guest posts if they'd like. The take up has been on the low side, which is a shame, but the quality has been very good indeed. And quality trumps quantity every time. The two most recent guest posts contain a mini-system to follow, and a user's experience with a high ticket price 'system'. Was it worth the cost? Find out here. If you'd like to write a post, we'd love to read it. You can find out how to here. Right, what's happening next? Well, in the hullabaloo surrounding the World Cup, it's almost gone unnoticed that next week is Royal Ascot. With Epsom's Oaks and Derby being a few days later than usual and Royal Ascot a few days earlier, there are just eleven days between the two meetings this year. Geegeez, as you'd expect, will have full coverage of the greatest flat meeting of them all, starting on Monday with an overall preview of who, and what, to look out for at the Royal meeting. And then, from Tuesday to Saturday, there will be full race previews on site. And, if you're planning to bet at Royal Ascot, but are not yet a Geegeez Gold member, now is an excellent time to take a trial, because your ten days will cover the whole meeting. Not only that, but the five day declarations are already available for Tuesday and Wednesday, and Thursday's early entries will be available later today! You can take a ten day unlimited access trial here. Do make sure you download the Gold User Guide here. It's packed full of useful hints and tips on how to get the best from your Geegeez Gold subscription. I can't wait for Royal Ascot. In my opinion, it is the single hardest punting challenge in the entire year. And I love it! And finally, the World Cup continues today with three matches. After an entertaining and controversial opening match - how unlucky were Croatia? - the World Cup final of 2010 is reprised this evening as Spain take on Holland. This is a clash of the titans, and there's clearly no love lost between the sides. Tasty! Although it's not my sort of bet, Coral are 4/1 about a red card being shown in that game, and it might appeal to some. Click here for that one. Also this evening, and offering more appeal from a punting perspective, Chile will be duffing up the moderate Aussies. Coral are offering all customers the chance to back Chile to win to nil at 6/4 - max stake £20 - and I make them an odds on shot to do that. I'm on. You can get this offer through this link. OK, that's all from me for this round up post. Lots of links to other places, so do take a moment to look at the various elements that take your fancy. And have a great weekend! Dubai Prince won (10/3 advised, returned 5/2) and Makhzoon was placed for a point profit on Thursday. I'm not sure how that report will look yet, and the loose specification above may change. But suffice it to say that, after a brief hiatus, a systematized The Shortlist will return, for Gold subscribers. Friday's final The Shortlist is below, and I'm afraid there's not a lot to go at. The Shortlist is a simple concept: I go through the Race Analysis Reports each day to find horses which I consider to be of interest. I then publish that list of horses here. Some will win, many will lose. It is hoped that the winners will cover the losers and leave a bit of gravy on the punting platter. Now, before I go on, I need to make (labour!) a really important point. And it is this: the Race Analysis Reports are deliberately interpretive. That is, different people will highlight different horses depending on whether they're using the win or place statistics, and which columns they sort on (based on which elements they consider most important in a given race). So, these will be the horses on MY shortlist. Feel free to do with them what you will. You may have a different shortlist, and you are most certainly encouraged to go and play with the numbers to find what works best for you. So, if you don't already have accounts with all the main bookmakers, you should get them. Seriously. Not only will they give you free bets when you start, but you'll also more importantly - always get the best value on any bet you make by ensuring you take the top price. It's just daft not to. Two big-priced shorteners yesterday, but nothing ran very well. Miss Tenacious actually should have won, but clouted both of the last two and lost all momentum, and first place. Thursday is the penultimate day of The Shortlist in its current format, and tomorrow I will have news of what is in the pipeline to replace it. Just the one runner yesterday, a loser, and Wednesday has this sort of feel to it. Firstly, many thanks for the many messages of support for The Shortlist. It's great to know people enjoy it and value it to such an extent. The problem with it is that it's quite time-consuming because I get side-tracked into checking pace and full form filters when I originally intended it to be 'merely' a view of the RAR. I'm giving some thought to how I can potentially automate my main RAR thought process into a 'The Shortlist report', which would be available to subscribers only. This should be possible and, if it is, would mean a Sunday service as well. Monday was a very good day, with three winners and two second places from six picks, and a profit of 7.25 points. Tuesday's very short The Shortlist is below. Important news regarding The Shortlist today. I have spent the weekend pondering various aspects of geegeez content, and have decided that - from Friday of this week - The Shortlist will end. It has been a fun and exciting addition to the site, with plenty of very big-priced winners, but as a free service which takes its lead from the paid content in the Race Analysis Reports, it's not fair to paying subscribers. There is not currently a plan to replace The Shortlist with anything else, though free subscribers will be able to continue to enjoy Double Dutch, our profitable 2 x 2 daily service. Monday's The Shortlist is below. 11/2 Bear's Affair paid for the five losers yesterday, and still left 10% profit on top. He returned 4/1 favourite, again again again highlighting the importance of taking an early guaranteed price. Saturday's The Shortlist is below, and it looks a typically trappy Saturday at that. Thursday was, as predicted, better than things had been going, and we managed two winners from four - the other pair finishing third. Better still, both of our winners were good drifters for a three point profit on the day. Friday's The Shortlist is here. Thursday's The Shortlist is here. The lean spell continues despite further market bashing. 20/1 pick Lord Buffhead was sent off at half those odds before finishing a fair fifth; and 4/1 At Reception was the 5/2 favourite at the off but could also do no better than fifth. It's a mantra I'll unapologetically repeat: if you consistently beat the market you WILL win. That's the value game. Wednesday's The Shortlist is here. We're bashing up the market right now, but not getting much joy from it. That will change as beating the market consistently is the key to betting success. Yesterday, we had 10/1 Zain Zone, which was second at 4/1 (! ), 17/2 Special Mate - nowhere at 7/2 (!! ), and 7/1 Fire Ship, 3rd at 6/1. Onwards. Tuesday's The Shortlist is here. A non-runner and a 9/4 winner, but not much else to cheer despite the usual number of significant market shorteners. I'm personally finding the last few weeks a very tough period in which to wager, Chester aside, and hope to return to form soon . Monday's The Shortlist is here.